Actor Toni Collette has appeared in numerous films including Muriel’s wedding , The sixth sense , About a boy and Hitchcock . She won an Emmy and a Golden Globe Award for her portrayal of a suburban housewife coping with dissociative identity disorder in the US television series United states of Tara . She also starred on Broadway in the musical The wild party . ‘For me it is important to find a connection with my subject in order to paint them,’ says artist Alexander McKenzie. ‘I feel there is a relationship between all artists, whichever medium or field they work in, and this became the impetus behind the idea for the portrait. 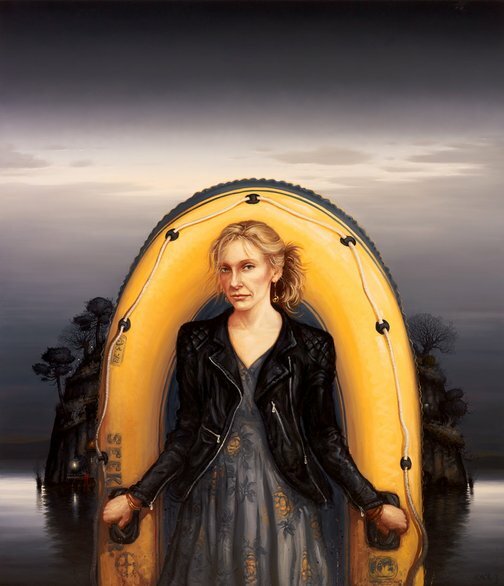 Born in Sydney in 1971, McKenzie is predominantly a landscape painter known for his luminous paintings, which recall both the themes of Western symbolist painting and the techniques of the 15th-century Dutch old masters. Increasingly his paintings evoke a strong narrative content. This is his sixth time as a finalist in the Archibald Prize. He has also been represented seven times in the Wynne Prize.